So Simple It’s Silly is a series of incredibly easy recipes (sweet and savory) that are originally my own or those I’ve collected from family, friends and the internet. Minimal ingredients, great short cuts and not at all time-consuming. I’ve been a bad blogger and not posting as much as I’d like or should. I have a ton of back logged recipes and restaurant reviews I’ve yet to organize or post. It’s overwhelming getting ready for the wedding, I’m even more sure that when it’s my turn, I really will elope! I finally got my dress for Friday’s Khmer ceremony and will get my Saturday’s ceremony dress next week when it comes. I’ve laid off eating out lately so I can fit into these dresses! I made this “Baw Baw Krueng” (Baw Baw = Rice porridge, Krueng = Spices) the morning after my Khmer Wonton Noodle Soup with the left over broth. It’s the ultimate comfort food for when we’re sick or just need that warm touch that reminds us of Mom. A quick and delish breakfast or lunch and since I made a great stock, why waste it right? I added chicken, some eggs and fresh herbs, although adding eggs is more a Japanese thing, I needed the extra protein to work out later! 1. In a medium pot over high heat, bring the stock to a boil. Add raw rice and chicken, let boil for 5 minutes before turning down the heat to low. Stir to make sure rice isn’t sticking to the bottom of the pot. Let simmer for 35 – 45 minutes or until rice is cooked and most of the liquid has been absorbed. Rice will look similar to rice pudding, very enlarged and almost falling apart. If you like a runny rice porridge, add more water or stock. I like a thick porridge so I leave as is. 2. Turn heat up to medium, stir in beaten eggs and allow to cook for 5 minutes. Rice will have a very creamy consistency after eggs are added. 3. Turn off heat and stir in fresh cilantro and green onions. 4. 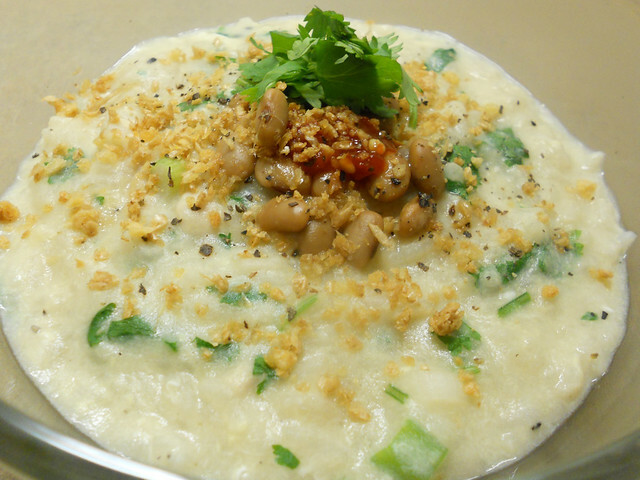 Serve with toppings of fried garlic, chili sauce, black pepper and fermented soybeans. 1. Fermented Soybeans are salty to very salty depending on the brand you purchase. The ones I used is NOT natto, that’s a completely different soybean product. 2. If you don’t have fermented soybeans or can’t find them, you can use a dash or two of soy sauce for the same salty flavor. 3. Instead of adding beaten eggs to the porridge directly, you can also soft boil them, cut in half and serve it as a topping also. 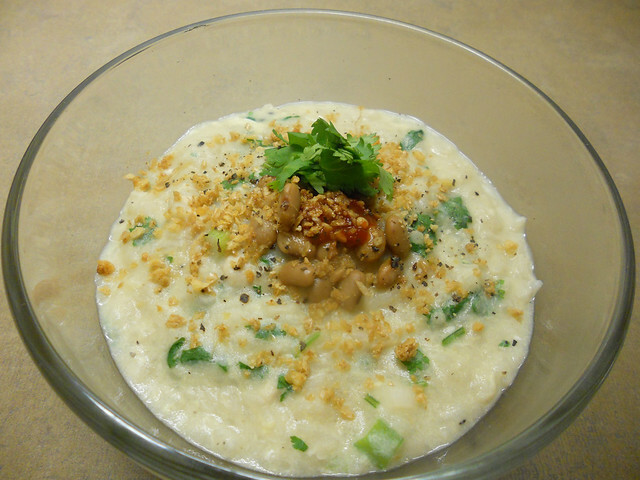 Hope you enjoy this incredibly easy Khmer comfort dish, good luck!